Our Prague Pub & Beer Tasting Tour is a warm spirited stroll around some of Prague's finest taverns and microbreweries. On the trip we sample six different beers, tour the facilities at one microbrewery to learn the science of brewing, and we discover the history of beer in the Czech Republic. And as it's a pub tour, the guide will have an interesting tale or two to tell! The tour starts near the Old Town Square, where we join our friendly, knowledgeable guide for our quest to seek out those hidden away pubs you'll want to return to. First, we visit a lovely old pub to sample Pilsner Urquell tank beer - you won't taste a fresher Pilsner Urquell anywhere in Prague! This historic tavern is a fitting place for the guide to explain the history of beer brewing, including the invention of Pilsner Urquell in 1842, the world's first golden lager. Next, we visit one of Prague’s beloved craft beer pubs, located in a former convent. We tour the on-site brewery to learn the science behind beer brewing, and try three delicious beers right out of the tanks. Afterwards, we move on to one of Prague’s newest microbreweries tucked away in the back streets of the Old Town. The owners have invested in the latest technology to create several unique craft ales, and we will be tasting two of the finest. At this stage of the night, Czech people when tasting beer often order traditional pub snacks, like cheese or spicy sausage. Select the snack you prefer, we'll order it, and it's also included in the price. This is the final pub. If you feel the night is still young, stay on to taste more ales. Or, we'll head back to the Old Town Square for the end of the tour. Prague Experience walking tours are in English and are led by experienced guides. If you require a tour in German, please specify on the booking form. -Similar pub/brewery tour in the daytime: Prague Brewery Tour. 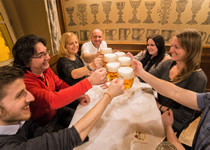 -Pub tour with less beer: Prague Pub Tour. Guided tour of 3 pubs/microbreweries + 1 Pilsner Urquell tank beer + 3 types of lager tank beers + 2 craft ales + Czech beer tapas.